Audiobus works like a virtual patch bay for your audio apps. Audiobus launched back in 2012, when iOS was far more limited than it is today. Back then, getting apps to play together seemed like magic. Since then, Apple introduced Inter App Audio (IAA), its own audio-routing method. IAA can work great, but it isn’t as flexible as Audiobus, nor as easy to use. There is no standalone IAA app to control the routing. Instead, you must flip between IAA-compatible apps and hook them together using often very different interfaces within each app. With Audiobus, you hook things up in one place, much like you’d hook physical instruments together with wires. Let’s take a look. Today we’ll use Audiobus 3 to send audio from a guitar amplifier simulation app (ToneStack) to a neat loop-recording app (Blocs Wave). ToneStack lets you plug a guitar into an iPad or iPhone and apply all kinds of neat effects to the sound, before running it through a virtual amp and speaker. Blocs Wave lets you build tracks from loops and samples, and also lets you record your own audio as a loop. It’s a really fun app to use, and you can get some amazing results. From there, we’ll send Blocs Wave’s own audio output into a recording app (AudioShare), also using AudioBus, to demonstrate multiple routing. But don’t worry. This is all super-easy and very fast. Step one, launch Audiobus. This is the first difference between IAA and Audiobus. With IAA, there’s no central place to manage everything. Adding apps to the Audiobus slots probably couldn’t be any easier. Step two is to tap the In button, then choose an input app from the list. I pick ToneStack, and it loads in the Audiobus Input Slot. You’ll notice here that a new, empty, route opens up to the right of the one I’m using. This happens every time you add a new input, making sure there’s always a route waiting if you need it. Step three is to add Blocs Wave into the Output Slot. The default output, if you don’t add one, is the iPhone’s own speaker. Tap the plus sign at the end, and tap Blocs Wave (or whatever you’re using). Depending on the app, Audiobus may ask you to Tap to launch it. Apps must be built to be compatible with Audiobus. The latest Audiobus spec launches apps in the background, but apps (like Blocs Wave) that haven’t updated need to be launched manually, by you. Tap to launch. Here’s the screen showing the input for Blocs Wave’s recorder. The sound is coming from Audiobus. Now, you just need to switch to ToneStack, set the sound up how you like it, and play your guitar. The audio will be routed straight into Blocs Wave for recording. It should Just Work. You’re not limited to a single route in Audiobus. As we saw earlier, every time you add a new source app into an Input Slot, a new route is created, ready to use if needed. If I want to record a performance in Blocs Wave, I don’t need to start over by ejecting ToneStack and so on. I can just create a parallel route. Use the same steps as before, only put Blocs Wave in the input slot, and your recorder app (I used the amazing AudioShare) in the output slot. 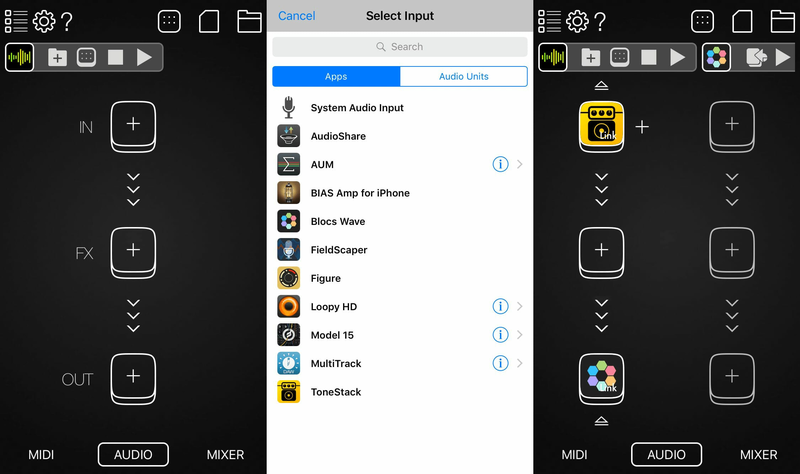 When you switch to AudioShare, you’ll see Audiobus preloaded as an input in its recorder. Here you can see the second route, with Audiobus loaded as an input in AudioShare. Flipping back and forth between these active apps can get old fast. Audiobus fixes this with its transport controls. As you can see in many of the above screenshots, a little Audiobus strip appears in all connected apps. This strip is a remote control for the apps. 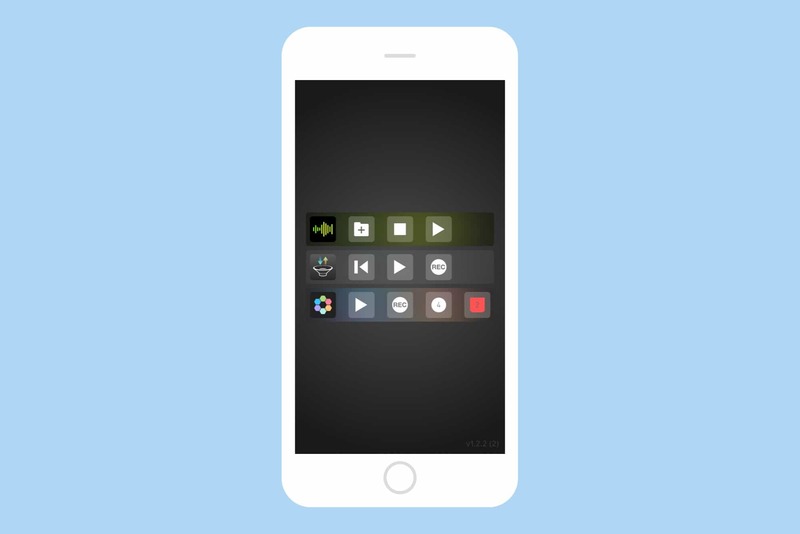 You can, for instance, play and pause the audio from a source app, or trigger recording. 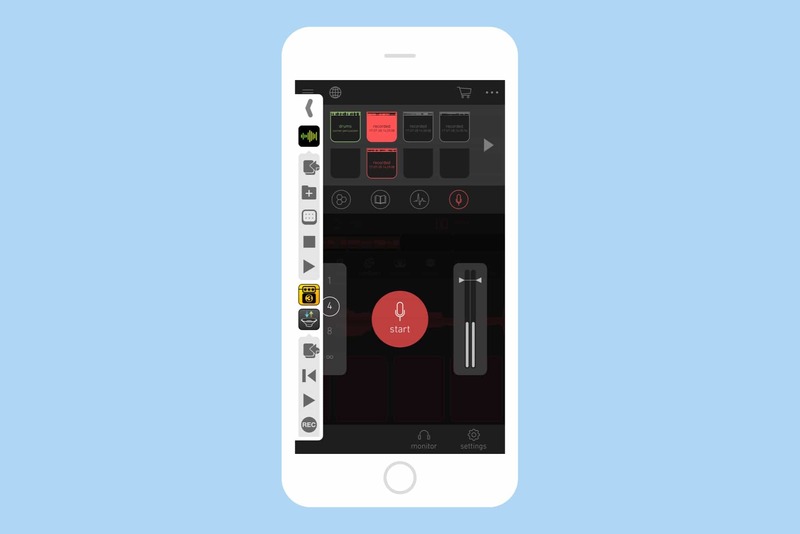 This strip lets you remote-control all the other Audiobus-linked apps. Look to the very bottom of the strip here and you’ll see the record button for AudioShare. That lets you trigger the recorder while you’re in another app. 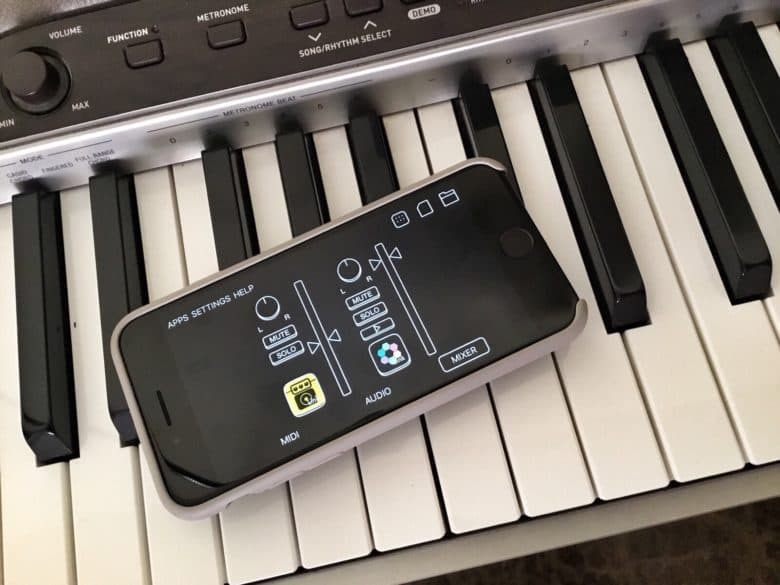 This is fantastic if you’re recording into, say, a looper app while playing your guitar, because you don’t have to worry about app switching interrupting your flow. 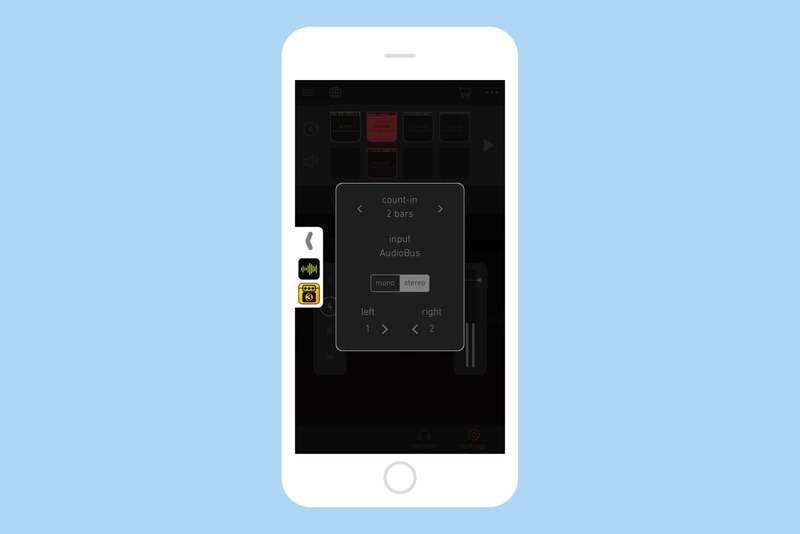 This idea of remote control is taken further in a $4.99 companion app, Audiobus Remote. This can be used on the same device as you’re running Audiobus itself, or on another nearby device. It effectively turns the control strip into a full-screen remote. You can run Audiobus Remote on a separate device. 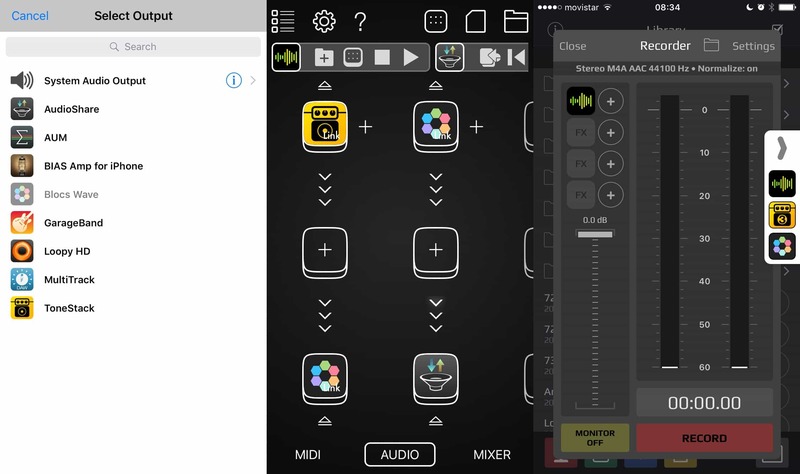 Using Audiobus Remote, you can have one app full-screen on your iPad, while triggering various other apps from the iPhone. Or you could use your brand-new, super-fast iPhone to run a whole lot of audio apps, and then use your years-old, too-slow iPad as a remote, where the slow CPU doesn’t matter, but the big-screen makes control easier. Audiobus does even more if you need it to. Audiobus 3 (the latest version) also routes MIDI. And it has a mixer panel, so you can switch channels in and out, and control their volumes with sliders. You may also have noticed another slot in the middle of each channel, between the Input and Output slots. This is for inserting extra effects apps in between the in and out apps, and is beyond the scope of this article. Do you need Audiobus when you could just use the built-in Inter App Audio from Apple? Not necessarily. But if you do any more than simple music-making on your iDevice, Audiobus makes everything so much easier that you should probably try it.